Assuming you have already logged in to Sitemagic CMS, now browse to Admin > Settings. Here you will find the Language section as outline below. Select your preferred language and timezone and click the Save button. 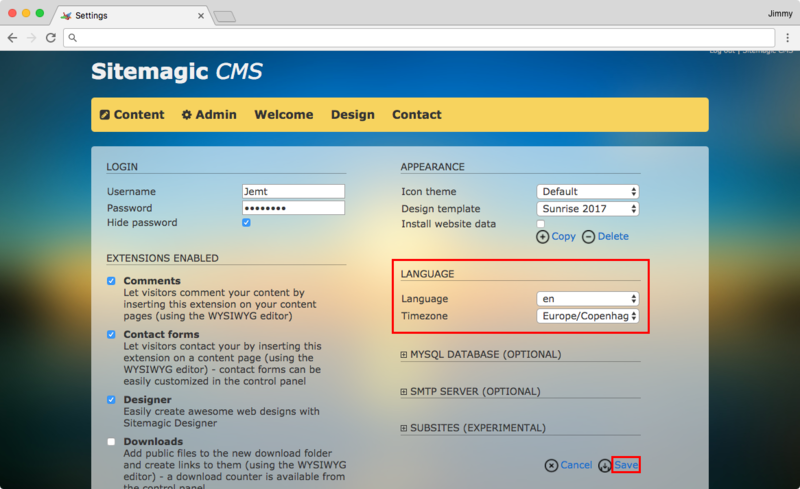 If Sitemagic CMS is not yet translated into your language, then you can translate it yourself using the built-in Language Editor. First make sure the Language Editor extension is enabled. Then browse to Admin > Language editor. To create a new language package, follow these instructions. Click the New button and enter the language code. Find your language code here. You would enter e.g. "it" for Italian, "pl" for Polish, "fr" for French, etc. The system now creates a copy of the English translation package with the new language code. In the Extension menu select a module/extension to translate (start from the top) and click the Edit button. Translate all the words and sentences. Go back to step 2 and select a new extension until all extensions have been translated. When you are satisfied with your translations, make sure you activate the new language.